Remember the opening sentence in Thursday night’s post: “A lot of folks jumping on the White Christmas bandwagon today, so I’ll begin this post with a word of caution”. This was inspired by a local TV station posting one model’s operational run snowfall forecast over eight days, leading many to believe there’d be a foot or more of snow on the ground by Christmas in Denver. Other media outlets followed the lead by promising a Christmas snow…really?! Did no one look at the models? Today, just two days after those forecasts, that same model that started the craze has cut its forecast snow totals by 84% through Thursday. It’s time that media outlets start analyzing the models and their ensembles, looking for the hows and whys, to prevent eating crow. As the season snows, snow goes the snow? We have a lot of moisture coming in over the western third of the country. Rain and snow cover much of California, Oregon, Washington, Idaho, Nevada, Utah, Wyoming and Montana. This moisture is now moving into Colorado for tonight night, Sunday, and Monday. The direction of this "flow" is from the northwest, which is generally not a good direction for anyone east of the mountains to get snow and or rain. However, the central mountains to the western slope will have lots of moisture Sunday and Monday. Some will have feet of snowfall. Many of the resorts will be adding well over a foot of new powder in time for the holiday rush of skiers/riders. Those resorts that face west and north will come out ahead of the others. It may surprise you that very little of all that moisture is going to get on the eastern half of the state, including the Denver area, although the entire state will see the clouds. A cloudy sky expected tonight through Monday for the metro areas. 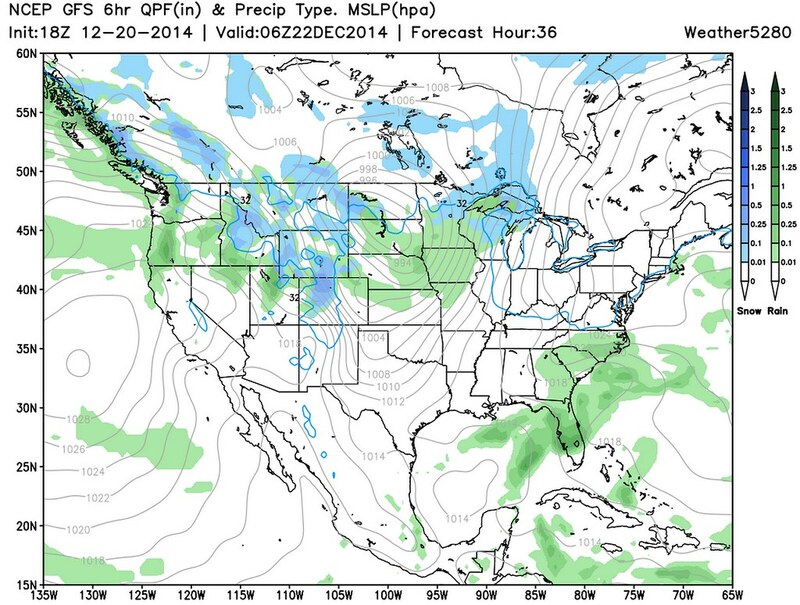 Denver and the Front Range has a slight chance for snow/rain by Sunday night and Monday. During this period, a stronger wind will be blowing overhead, 20,000 feet or so, and that may draw enough energy to give a snow band or two for the city areas. That is only If that wind can tear enough moisture away from the mountains, like pulling strands from a cotton ball. While a few days ago it looked a bit more promising that we’d have enough energy to enhance a few of these snow bands, at this time this does not appear to be the case. In cases where some banding may occur, the troughs will be to the east of us, thus limiting the lift and limiting the extent and amount. A weak cold front Monday will not do too much to shift our winds and enhance upslope either. If we manage to ‘steal’ some moisture from the mountains, the result will be a few areas with a few inches of snow, but not for everyone -- just in small pockets. This first push of moisture will take a bit of a break Tuesday and Wednesday, which will be the best travel days within the state ahead of Christmas. Then, another push of moisture will move through around Christmas Day. We don't see nearly as much humidity with that next one though, so the chance for snow will be less than this first system, and again focusing on the central and northern mountains the most. Being realistic we won't and can't say that Denver and the metro areas won't have snow falling on Christmas. It certainly remains a possibility. However, the chance for snow on the ground or actively falling isn't overly optimistic. The operational ECM which once showed several inches of snow Christmas night produced 0.00” QPF for DEN at 12z today, and its ensembles about an inch. The ECM has been underperforming the GFS this December anyway. The GFS has remained most consistent with this system producing little snow for the eastern half of the state. The lack of snowfall for Christmas isn't much of a shock, as it fits with our history. Only 18 times since the late 1800s has snow fallen on Christmas Day in the city. Denver does not have snowfall on Christmas Day very often. Click here to read more about historical our chances. Still some hope for snow this week, maybe? Maybe. Again, a few locations may “get lucky” on Monday and see quick hitting dusting to a few inches, but most others will likely stay dry, or even see some rain. The best chance for things to turn in the other direction may still be with the Thursday/Friday storm, but for now this doesn’t appear likely. While the trend has very clearly been for less snowfall with this system, there are still enough differences between the models keep some uncertainty going here. As it stands, the upper level support just doesn’t appear to be there with this system to produce any meaningful snowfall for the Front Range, even with the more bullish models. Still time of this to change, but it would require a little help from the storm out in front of it, and a good kick to the current trend, which is hard to do. Enjoy your weekend, and get to the mountains if you can!